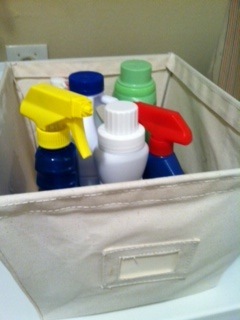 Open canvas storage bins are among my favorite organizing products. I use them all over my own home. Here's how! I find them to be helpful storage solutions in a variety of ways, and I use them both professionally and personally. Want to see inside my home? Click here! Below you'll find 10 different ways to use open bins for storage as well as product recommendations. Enjoy! 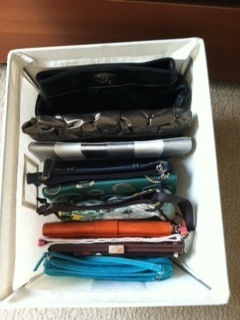 I use one bin for purses, one for clutches and one for small tote bags. Using an open bin for these items is great, because they do not stack or stand up well. Throw the item into the bin and clean up is done! 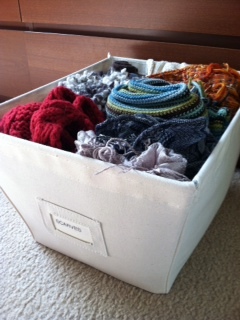 I use open fabric storage bins for accessories (one for each) like scarves, hats, gloves, bathing suit cover ups, and so on. This is great for an easy seasonal switch. When winter time comes around, I put the bins with the summer accessories on the top shelf in my closet and bring down the ones with the winter gear. For a client, I used different open canvas storage bins for each type of bed linen: king sheets, queen sheets, twin sheets, sheets for her son to take to summer camp, extra blankets, and extra pillowcases. This is an easy way to put away the linens and keep the closet shelves tidy without any toppling. I use an open bin for my dog's toys, so she can easily get what she wants and clean up is as easy as throwing the toys in. I use another bin for the rest of her stuff like jackets, grooming tools (in a Ziploc bag), and so on. I have a laundry closet with a single long shelf above the washer and dryer. To keep things organized and handy, I use open canvas storage bins for the laundry accessories like dryer sheets, stain removers and so on. One day I will have a beautifully huge closet where I can store my shoes side by side and there will be no piling involved. 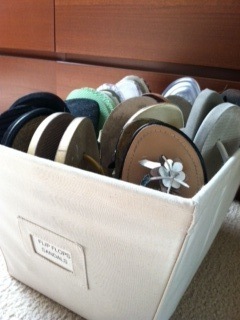 :) Until that dream becomes a reality, I utilize open canvas storage bins for my seasonal foot wear. Below is a picture of my sandals. Just like the bed linens, you could use open home storage bins to categorize and store your bath linens. One could be for bath towels, one for beach towels, one for hand towels, wash cloths, extra shower curtains and so on. Since we don't currently have a garage, we use an open canvas bin in our entry/sports closet to hold balls and other sports accessories. Open organizing bins are fantastic for organizing toys. You could use a different bin for each category like one for small stuffed animals, one for dolls, and so on. Labeling the bins will aid in teaching your young kids to read and also shows them how to be organized. This additionally makes clean up a cinch - throw it in and you're done. As an extension of the above tip, open bins are useful for storing kid's books which tend to be a variety of shapes and sizes. Rather than trying to make them fit on a shelf, utilize an open storage bin! Here are the open storage bins I've used and love! My favorite open bin, this is a product of The Container Store and comes in different sizes and colors. They are sturdy, affordable and match any decor. This is the product I have in the photos above. 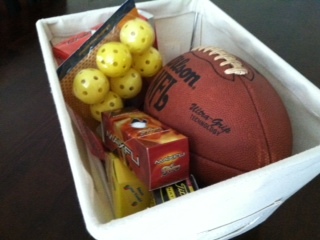 Another Container Store product, this bin is mesh for quick content recognition and rolls for easy mobility. These are awesome storage bins for kids. Put their stuff in and let them label and decorate the outside. I use these little colorful folding storage bins inside of the large bin of pet accessories I have. See them in use here!